The smartphone world is dominated by Android, which accounts for more than 2 billion devices across the globe. Apple’s iOS follows closely, with the likes of Windows Phone, BlackBerry and Symbian following from a distance. BlackBerry and Nokia have already conceded defeat and joined Android and as it is, Microsoft has just put the final nail in the Windows Phone coffin. The tech giant is now selling the Samsung Galaxy S8 and Galaxy S8+ via its official online store, a move that not so many saw coming. 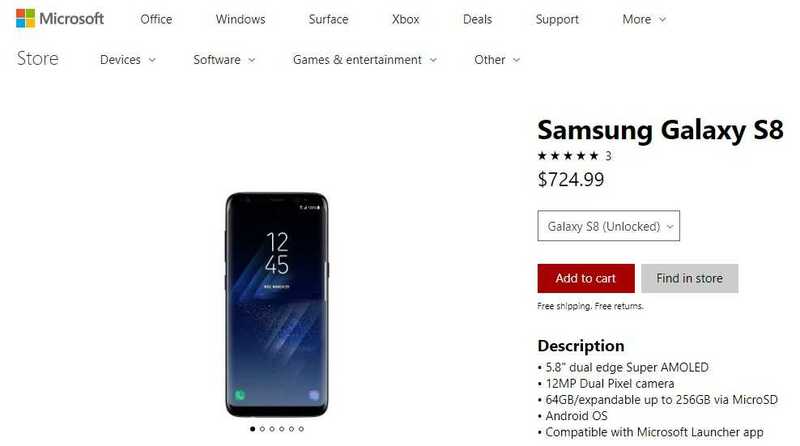 First spotted by MS Power User, the company is even getting ready to throw in a Black Friday offer for those who buy the Galaxy S8 via the Microsoft Store. At the moment, you can get either phone unlocked or locked to either Verizon or AT&T. There are three color variants of orchid gray, black and silver. As for the prices, the unlocked Samsung Galaxy S8 can be yours for $725 while the Galaxy S8+ will set you back $825. Carrier variants have different price tags, but as noted, you can stick around until November 23rd and grab the unlocked models with a discount of $150. Microsoft has been selling Samsung Galaxy S8 and S8+ via its brick and mortar stores, but this marks the first time the phones are also available via its official online store. Microsoft might want everyone to believe that this move is only aimed at marketing its mobile apps that are now compatible with Android, but this could be an indicator the Redmond Company is giving up on Windows phones.